This 1901 dated patent is entitled Improvements in, or Connected with, the Metallic Junction Fittings of Shoulder Belts and Bandoliers. Patrick Alphonsus Martin, Managing Director of the well-known leather working firm Martins of Birmingham, is listed as the inventor. The application date was 23rd November 1901, and the patent was granted with an acceptance date of 2nd October, 1902. Even the most cursory glance at the drawing at left makes it obvious that the design of the 50 Round Bandolier, Mk. 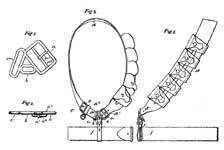 I. derives directly from this patent. Most particularly, of course, is the the design of the elaborate cast buckle, and the patent is concerned only with the metallic fittings themselves. In addition to this, though, the design of the cartridge pockets, the steadying strap, and the arrangement of 5 pockets across the front were all carried over unchanged in the Patt. '03 Bandolier. It's particularly interesting to note that the pockets shown in the drawing are clearly intended to carry rounds in chargers, even though the standard arm of the British military at the time was the Magazine Lee Enfield, which was not a charger loaded rifle. However, the famous "Trial of One Thousand" (officially the Trial of the Short Rifle by the Army and Navy), which tested the Short Magazine Lee Enfield (and which was charger loaded), was under way, and the fact that charger loaded weapons were soon to come must have been known in the trade. The List of Changes entry for the Accoutrements, naval, pattern 1901 (§11110, dated 8th August 1901) specifically states that the pockets of that Bandolier were designed to accomodate rounds in chargers. Martins would certainly have known of this - whilst at this point KW have not seen a Patt. '01 Naval bandolier with a Martins makers' mark, they are known to have produced many Bandoliers of earlier patterns, as well as similar Land service bandoliers (§10764 dated 19th June 1901). It must be noted, though, that those Bandoliers did not accomodate rounds in chargers. Also of interest, though, is that Martins are known to have produced Bandoliers for both sides during the Second Boer War, and the Bandoliers they made for the Boers were designed to carry ammunition in chargers for their Models 1888 and 1898 Mausers. The complete patent can be accessed by clicking this link: Improvements in, or Connected with, the Metallic Junction Fittings of Shoulder Belts and Bandoliers. It as presented as a PDF, and you'll need to use your browser's Back Button to return to Karkee Web after accessing it. The Bandolier Equipment, Pattern 1903 50 Round Bandolier, Mk. 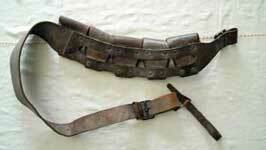 I, was introduced with the Pattern 1903 Bandolier Equipment in List of Changes entry §12389, dated 20th October 1903. It has five pockets, each of which holds ten rounds of .303-inch ammunition in two 5 round chargers. 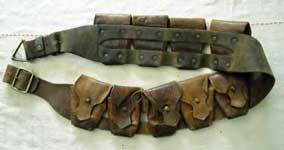 The Bandolier is cut on a curve to fit over the shoulder and has a small steadying strap that fits around the Pattern 1903 Waist belt. The Mk. 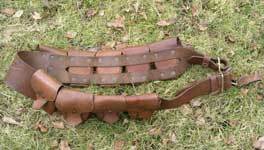 I Bandolier is easily identified by its elaborate cast buckle. This Mk. 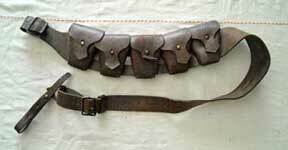 I Bandolier is maker marked "BECKWORTHS LTD. C &M." and is dated 1903. From the Karkee Web Collection. The Bandolier Equipment, Pattern 1903 50 Round Bandolier, Mk. II, replaced the Mk. I Bandolier in List of Changes entry §13273, dated 27th November 1905. It is similar to the Mk. I version, except that the complicated buckle of the Mk. I has been replaced by a plain buckle, a short strap, and a brass triangle. 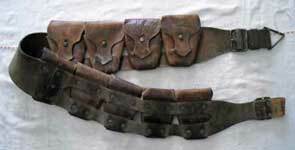 This type of Bandolier was produced in huge numbers, and was still being made in South Africa as late as the 2nd World War. This typical example is maker marked "S. Clarke & Co." and is dated 1918. From the Karkee Web Collection. The Bandolier Equipment, Pattern 1903 90 Round Bandolier, Mk. I, was introduced in List of Changes entry §12424, dated 29th September 1903. 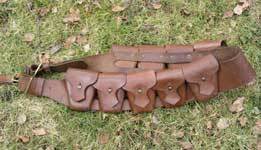 This variation has four additional 10 round pockets attached to the back of the Bandolier, the buckle has been modified, and the steadying strap has been omitted. This Mk. 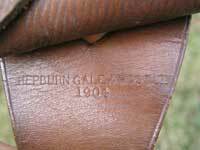 I example is maker marked "Hepburn Gale & Ross Ltd." and dated 1904. It is marked to the Royal Horse Guards (RHG). Far left, the "double buckle" version of the Martin's patent buckle, unique to the Pattern 1903 90 Round Bandolier, Mk. I. It's also worth noting that, although the L. of C. states that the steadying strap was to be omitted, it is present here. This example from the WD Militaria website, used with permission. As with the 50 round version, the 90 Round Bandolier was upgraded to Mk. II in List of Changes entry §13273, dated 27th November 1905, with the same simplifications to the buckle. At left, an example of the Mk. II version, maker marked "[illegible] / London" and dated 1915. From the Karkee Web Collection. This interesting Bandolier is not an issued component of the Bandolier Equipment, Pattern 1903, and we have not seen an L. of C. entry for this type. It is obviously modelled on the Pattern 1903 Bandoliers, though, and for that reason alone seems worthy of inclusion here. It is a symmetrical ten pocket Bandolier holding 100 rounds. 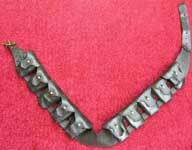 Recieved wisdom among collectors is that this type is post-WW I Canadian, intended to be used as a cavalry horse's neck Bandolier. During the Great War, horse Bandoliers were the standard Patt. '03 90 round type, as has been shown from numerous period photos. These 100 round examples are said to have been assembled from recycled 50 round Bandoliers as part of a salvage scheme. KW would very much like to have more information on this Bandolier. Photos from an unrecorded source.